I have been undergoing a transformation recently, as I move away from making jewelry to making visual art again. When I moved from New Mexico to Massachusetts, my studio was smaller; I opened an Etsy shop, and it made more sense to focus on my jewelry. But my heart has always been with visual art, with what can be explored, shown, transformed. Additionally, though many people seem to like, even love my jewelry, I'm not selling. I can't, because of my health, do art fairs or belong to cooperatives, which were the major sources of selling my jewelry in the past. And I'm just not making the sales in my Etsy shop. On the other hand, the moment I listed my small drawings, they were snatched up. Don't get me wrong. I have never made visual art with the primary intention of selling. For me it has always been a voyage of discovery and personal transformation. But it sure doesn't hurt when someone likes my art enough to buy it. This new direction means a re-do of my studio area, putting my jewelry making supplies, which are all over the place at the moment, away and re-establishing my area as more of an art making center. 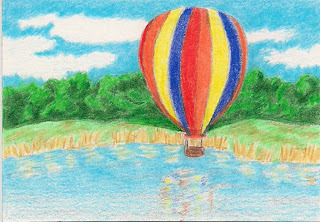 So far I've been working in the small format ACEO (Art Cards Editions and Originals), which is 3.5 " x 2.5 ". It's been a great way for me to stick my toe in the water again. And because the format is small, it doesn't take quite so long to build up all those transparent layers I love to build with my colored pencils. My most recent, "Up and Away," was done as a "challenge" for one of the art forums I belong to online. To me, it's also a metaphor ~ what will I recover and discover as I take up my art journey once again?